List of One-Stop Service Center for Overseas Filipino Workers - Exam News, Reviewer, Military Career, & Everything [MN] . .
Last August 15, 2016, the Department of Labor and Employment (DOLE) has launched the first one stop service center for overseas Filipino workers (OFW’s) in the country. This service center will simplify government frontline services to be more accessible to Filipinos who are currently working or planning to work overseas. 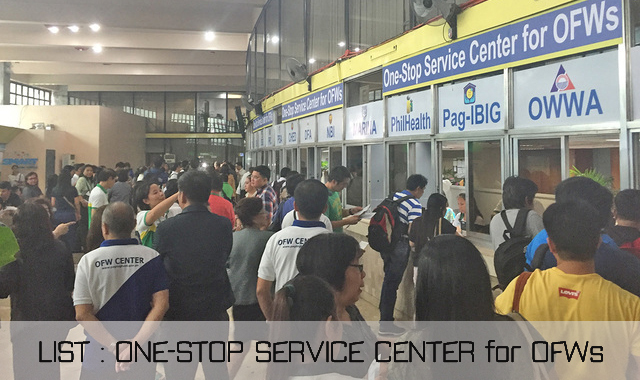 One Stop Service Center for OFW’s (OSSCO) is seen to reduce transportation expenses of OFW’s and shorten the processing time of their documents also these will provide them the facility for obtaining their requirements for their efficient deployment. According to the Department of Labor and Employment Secretary Silvestre Bello III, when a document, like an application for a permit or any document, comes to an office, the document has to be acted upon within 72 hours. A total of 14 representatives from various government agencies with services relevant to the OFW’s positioned inside the One Stop Service Center for OFW’s. This action is in response to the directive of President Rodrigo Roa Duterte to make it easier for the OFW’s to avail the services of the government. Location : New City Hall, Koronadal City.. Location : POEA ADMINISTRATION MAIN OFFICE Blas F. Ople Building, Ortigas Avenue corner EDSA, Mandaluyong City. As what Secretary said One-stop centers will be set up also in all regions spearheaded by the Department of Labor and Employment Regional Offices in coordination with the regional offices of the agencies cited above, local government units, and other partners and stakeholders. At the OSSCO, government frontline services are made accessible to Filipinos who are currently working or planning to work overseas. It operates from 8:00 A.M. to 5:00 P.M., Mondays to Fridays.